Fibromyalgia means muscle fiber pain. It is characterized by muscle, tendon and ligament pain, along with flu-like symptoms. This chronic disease is unpredictable and ranges from mild to disabling. The cause of fibromyalgia is not known, and while it seems to run in families, no genetic component has been identified. Currently, it is thought that people with fibromyalgia may have a deficiency in magnesium and/or lower levels of the neurotransmitter known as serotonin, which is responsible for mood. Making the diagnosis of fibromyalgia is difficult, as it closely resembles many other diseases such as chronic fatigue syndrome and multiple chemical sensitivities. If you have been diagnosed with fibromyalgia, it's important to learn how to deal with the pain and discomfort it causes. A blended approach to treatment involves both conventional and alternative methods. One of the ways fibromyalgia is treated is by an elimination diet to find out whether food intolerances are contributing to the disease. Supplements such as magnesium and malic acid can be taken. Exercise is recommended to reduce pain and stiffness. Meditation is good for relaxing the body and mind. Biofeedback to lower stress and taking ground red pepper, or capsicum, -- which is a powerful pain reliever -- can both help control pain. Homeopathy treatments include Arnica, Bryonia, Hypericum and Rhus toxicodendron. Acupuncture and acupressure are both helpful. Prescription medications, including antidepressants, are conventional medical treatments. Joseph Dispenza, author of “Live Better Longer: The Parcell’s Center 7-Step Plan for Health and Longevity," says that bathing with Epsom salts and baking soda can bring relief to the fibromyalgia sufferer. He recommends 1 lb. of Epsom salt and 1 lb. of baking soda to a tub of water as hot as can be tolerated, soaking for 25 to 30 minutes until the water is cooled, and leaving the tub without rinsing. 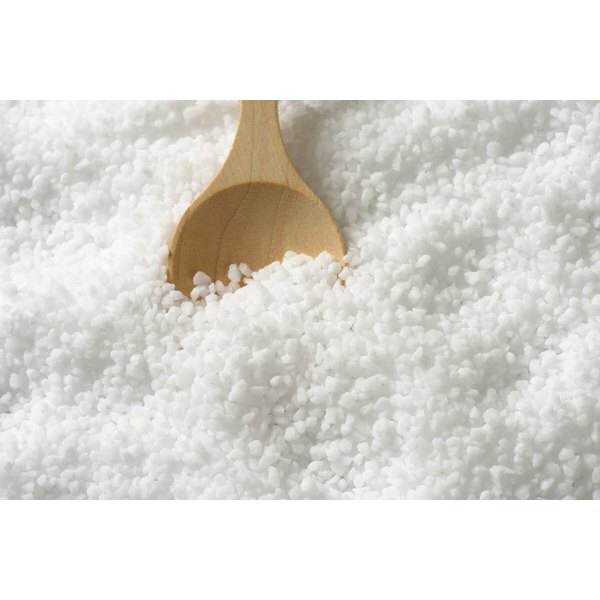 Epsom salt is magnesium sulfate. According to Mark London in his investigatory report “The Role of Magnesium in Fibromyalgia,” magnesium deficiency may play an important role in the disease process. Magnesium is involved in many functions of the body, including regulation or inhibition of nerve receptors, which are considered sources of fibromyalgia pain. Magnesium sulfate can be absorbed through the skin directly into the bloodstream to help muscle tissue relax. Baking soda is an alkalizing agent and, according to Dr. Rita Louise, author of “An Energetic Look at Fibromyalgia,” it assists the body in releasing energy and toxins from the skin. This reduces stress and helps the body to relax. Dr. Dispenza’s recommendation that the bath water be as hot as can be tolerated is based on the fact that when the body temperature rises, blood vessels in the skin dilate and carry blood close to the body’s surface to cool. Toxins are brought to the skin to be released, and absorption of magnesium and sulfate takes place. Staying in the water until the water cools allows the skin to release toxins. Judith Swan has been writing since 1999. Her work has appeared in the "Journal of Psychosocial Nursing" and instructor ancillaries for four published nursing textbooks. Her articles reflect expertise and interest in nursing, health and therapeutic communications, alternative health practices and disease prevention. Swan is a registered nurse educator with a Master of Science in nursing from Concordia University Wisconsin.